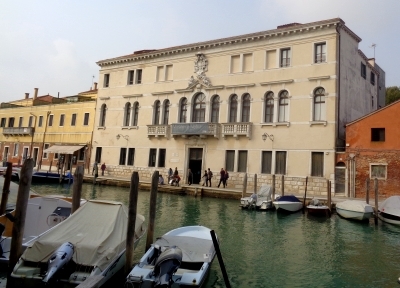 This article deals with the glass museum of Murano. Information about the whole island can be found on this page, information about glass and glass production in Murano can be found on this page. Also we have a page about the island Murano. The Museum of Glass is located in the centre of the island and is one of the most famous glass museums in the world. The island of Murano can be reached by public transport from Venice. There is a jetty (boat stop) next to the museum called "Museo". The exhibition is in a large palace directly on a wide canal. The building (Palazzo Giustinian) was the former seat of the bishop of Torcello. The glass museum is often simply called the "Museum Murano". The Italian museum name is "Museo del Vetro", in the tourist language English it is simply called "Glass Museum". What do you see in the Murano Glass Museum? The museum has two floors and an outdoor area. Glass production in Venice and especially on the island of Murano began in the Middle Ages. In various rooms there are exhibits from past centuries. Some of the glass art works are donations of the large glass company Murano. One of the highlights of the museum is the Coppa Barovier from the 15th century (see picture). 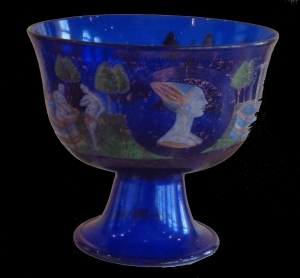 The large, dark blue chalice was a noble wedding present at that time. It is decorated with gold and some figures. The Barovier Cup is so well known that many shops on the island of Murano now offer copies in various sizes. In the next room you will see a large miniature glass garden. A huge chandelier is also one of the highlights of the glass museum near Venice, which has existed for over 150 years. We particularly liked some exhibits from the 15th to 17th centuries. This was the great glass age in Venice. There are also changing exhibitions of contemporary glass artists. For example in autumn 2017 by Rosslynd Piggott (Australia) and by the famous artist Marku Piri (Finland). The normal admission to the glass museum of Venice on the island Murano is 12 Euro. There are discounted tickets, for example, for pupils and students (9.50 euros). Children under the age of 6 do not have to pay admission. In addition, family tickets and a combination ticket with the top museum Burano (together same as just the glass museum Murano 12 euros) are sold. Burano is a neighbouring island of Murano. In the high season (April to October) 10 am to 6 pm, in the rest of the year one hour less (10 am to 5 pm). As far as we know there is no rest day. Larger groups may be able to arrange other opening hours on request. Almost all visitors to the island visit the glass museum and other sights of the island, in particular demonstrations by glassblowers. There are about five waterbus jetties on Murano. Not all lines stop at the station "Museo" next to the glass museum. But you can also get off at other stops, these are at most 15 minutes walk away, the island is not very big. The museum is located at the marker central on the Venetian island. The Murano Museum has vending machines with drinks and snacks. These are very inexpensive for Venice (coffee under 1 euro, mineral water 0.5 liters 1 euro). In front of the exit one gets, as usual today in bigger museums, through a bookstore. Books about glass, Murano, travel guides about Venice and also children's books are offered in different languages. Bags and backpacks must be locked in free lockers at the entrance to the museum. There is a toilet in the Glass Museum (after the entrance, i.e. only for museum visitors with a ticket).